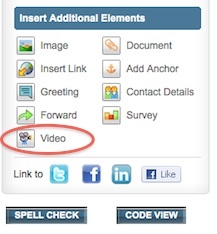 Embedding a video is a fast and easy way to enhance your email campaigns. 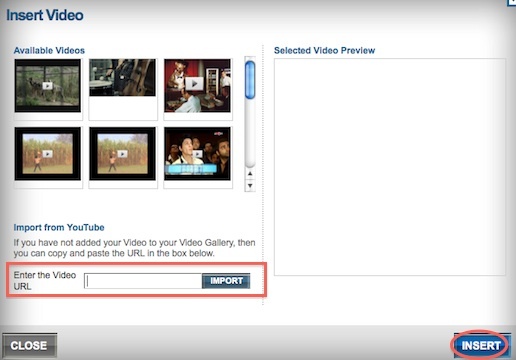 It’s as simple as copy and pasting the video’s URL from YouTube, Vimeo or Blip.tv. Although YouTube is obviously the most popular and probably what you are most familiar with, each site has its benefits. …and then choose Video from the Insert Additional Elements menu that pops up on the lefthand side. Copy and paste the URL from the video you would like to embed in your email where it says Enter the Video URL and click Import. Make sure the proper video is selected from your Available Videos and hit Insert. If you are already familiar with YouTube, there is probably no reason to use another site. YouTube supports up to 1080p and allows you to upload files up to 2GB in size or 15 minutes in length. There may be some practical uses for videos longer than 15 minutes, but their place is probably not in an email campaign. Attentions spans are short these days and your videos should be too. Vimeo used to be the HD alternative for YouTube, but YouTube has since caught up. Now Vimeo is an option for videos exceeding 15 minutes in length. Their free account only allows for uploads of up to 500MB per week and full 720p HD. If you have a need to upload more than that, a paid Vimeo account runs about $60 per year. Blip.tv is more focused on web shows. If you want to include weekly how-to shows or something similar in your email campaigns, Blip.tv might be your best bet. The site is geared towards that and you will get assistance with distribution - and they even have a revenue sharing option in terms of advertising.